Canals are dangerous and should not be used for any recreational activity. Even if the surface water appears smooth and calm, there are many areas where the current can swiftly pull an individual under—especially a child. The canal system and ditch roads of North Unit Irrigation District are considered private property and are not for public use. The district also periodically uses herbicides in the water, which can cause skin irritation. Never swim in irrigation canals. Keep young children and pets away from canals. Never jump in to rescue pets. Call 911 for help. Do not play near or on canal banks. They are steep and can be slippery. Canal safety awareness started in 1998 after two drownings in NUID canals in two consecutive years. 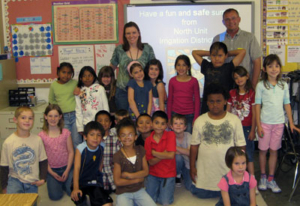 In 1999 the canal safety program coordinator and watermaster began presenting the canal safety program annually to second graders in three local elementary schools. After a brief slide show of dangers in and around canals are discussed, the students are shown a short video entitled “Otto the Otter’s Scary Rescue.” Following the video students are encouraged to ask questions and provide ideas for alternative ways to stay cool during warm weather days. Bilingual “Otto the Otter” coloring books are provided for each student and can be downloaded from this website. If you would like more information or would like to arrange a presentation, please contact the NUID office (541) 475-3625.